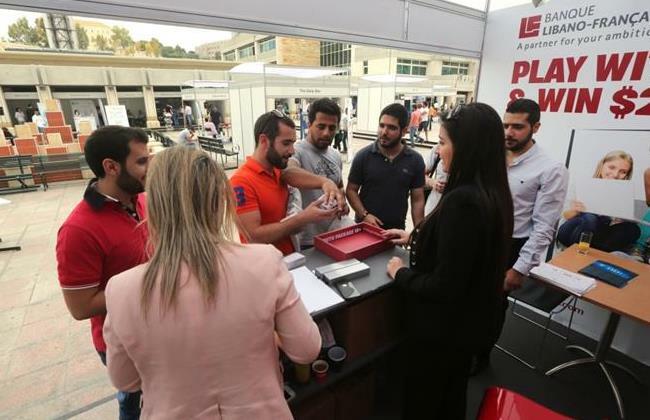 BEIRUT: While Lebanon’s economy is still struggling to recover from a 3-year-old crisis tied to regional instability, employers are cautiously optimistic and willing to invest in young talent, recruiters told The Daily Star at Notre Dame’s job fair. “The banking sector in Lebanon has been very solid,” said Nadine Nawar, a recruiter for BLOM Bank. BLOM Bank, she said, carefully tracks the progress of new staff, and facilitates their opportunities to rise in company ranks. While the economic situation slowed recruiting at ITG Holding, an information and technology company, recruiter Cynthia Hermes said she was now trying to fill 40 vacancies per month. “You have some fields that will never stop, even if there is a difficult situation in the country,” she said. ITG, Hermes said, is looking for high quality candidates who are willing to make sacrifices for their career. “It’s difficult to find good caliber candidates because they often cannot handle too much stress or big workloads. They are not even willing to do things like work overtime,” she said. “First of all, we’re looking for people with good communication skills,” she said.